Goat Cheese-Prosciutto Maki Rolls - A recipe from Savor California, the online showcase for extraordinary gourmet foods and beverages from California. Recipe created by Bob McCall, Cypress Grove Chevre. Mix all ingredients except prosciutto and asparagus in bowl and let rest at room temperature. Take one slice of prosciutto and place on cutting board. 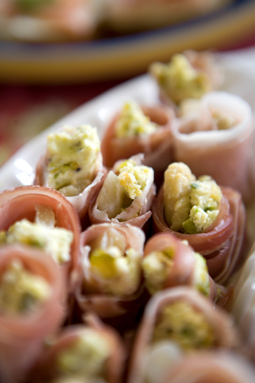 Spread a dollop of filling from one side of the prosciutto to the other, widthwise (not lengthwise.) Place one spear of white asparagus on top of the filling with the tip emerging by 1/2 inch. Roll tightly and slice into 1-1/2 inch sushi-size pieces. Arrange on plate similar to a Japanese Maki roll. Simply put 1/2 tablespoon of the same filling at the end of an endive leaf and serve. Recipe courtesy of Bob McCall, Cypress Grove Chevre.